Harrison's Pellets are a healthy and nutritious pelleted diet for your Feathered Friend. Even our most finicky eater Jerry our African Grey loves the taste of Harrison's Pellets......Our DYH Amazon will do tricks to get a Harrison's Pellet and Our Parakeet Snowy has been on them for years. Healthy never tasted this good! Oven Fresh Bites by Caitec are the newest Pelleted Bird Diet on the market. Oven fresh, oven baked, healthy wholesome ingredients make for a Happy, Healthy bird! We love to give our birds lots of different pellets so they are not bored with just one pellet. Oven Fresh Bites are a great addition to your Feathered Friend's pelleted diet. 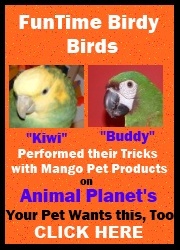 If your feathered friend is in the mood for a treat....I love to feed my birds Lafeber treats on special occasions. I have found that these wonderful healthy Lafeber birdy treats can be used to encourage foraging. I use them with all my flock's foraging toys except for my Amazon "Kiwi" who for some reason would rather forage for a pellet than a food treat. Please note, that Lafeber treats are only treats and should not be used as your bird's main diet.